The dental team is overwhelmed tending to patients’ needs, scheduling new appointments and helping with daily operations. A treatment coordination conversation in the midst of it all may feel to them like one more thing to do. Arm team members with three simple questions to focus the conversation, engage the patient and more likely turn the inquiry into that next big case. Question #1: What is your understanding of your situation? Does this image depict a young woman or an older adult? The young woman has a scarf over the back of her head and a feather in the front. Her silhouette barely shows her eyelashes and nose. Her jawline is visible above the choker she wears around her neck. 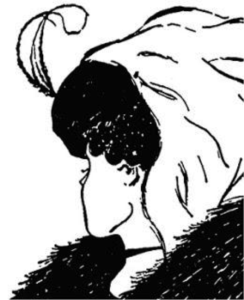 The older adult’s headscarf is pulled over the left side of her face up to her left eye, and there is a feather on the other side. The younger woman’s jawline and choker become the bottom of the elder’s nose and her mouth, respectively. This is your team’s opportunity to speak directly about how treatment might actually make life better. After all, that is the heart of the matter. This is the golden opportunity to ask more of the right questions: What foods does he enjoy eating? What does he do for a living, and how important is his smile to his success? What does his spouse think he should do? The answers to these questions may help him to draw some new conclusions for himself. The goal here is to ask open-ended questions to get him talking, help table topics that can’t yet be agreed upon and assist him in seeing commonalities in other viewpoints, which may lead to a signed treatment agreement. Question #2: Why is that important to you? As your patient shares thoughts and insights, listen closely to what motivates him. Self-confidence is a big motivator for dental patients, of course. But go deeper. Your prospect may equate a transformed smile with achieving a certain career path, financial freedom, even finding new love. Freedom is a big motivator for people. They just want to be sure that they will be able to preserve the autonomy that is at the core of being human, and being able to properly smile, speak and eat are integral to personal freedom. As your prospect shares the situation with you, it is critical to ask at several points during the conversation, “Why is that important to you?” Watch carefully what happens. Typically, people let their guard down and get vulnerable. This is the soft, lovely place where relationships are built. The answer to this question is gold in getting the patient to make the right choice for himself. Your team now has the insight needed to truly demonstrate that they can help him maintain that sense of freedom and self-confidence. Question #3: Are you ready? The reply will give both the dental team and the patient himself the ultimate clarity on what to do next: proceed, or table the conversation. Either way, everyone involved gets to focus energies on the highest and best use of their time, even if that means moving to the next patient and not pushing this one any longer for now. Simply by asking the right questions, you open up all of the possibilities for all of the involved parties.